This issue has an interesting setup. We start off with a murder in a gems mine in 1848 and then we cut to the present as Flash stops a jewel heist by, and I quote, Central City’s most dysfunctional villain duo: Chroma and Tar Pit. These two are always infighting apparently and rarely get along, which is kind of amazing since they still manage to pull off a job like this. Almost. The humour between the two of them, and the silliness of it is a welcome distraction from the more serious issues we’ve had in The Flash of late, so in that respect this issue fills an important niche just like last month’s issue. Its welcome, really. We can do with a bit of silly humour now and then. But that’s not all. In the middle of apprehending these two villains, Flash uncovers an underground burial site with no less than seventeen skeletons present. As the mystery of who killed these people is slowly teased out, Barry becomes obsessed with the case, going so far as to believe that if he can solve this mystery, then he can finally find out who killed his mother and why. In that respect, Brian does a complete 180 from the opening of the issue and most of the story here is taken up with the personal moments we see here with Barry, whether it is him organising all the case files or going to visit his father in prison. For those who may not know, Barry’s father is in jail for the murder of his wife and Barry’s mother. But Barry believes him to be innocent and that’s a great angle to explore here. Brian managed to surprise me a lot with this story. I enjoyed it. The personal nature of it is definitely one of the big selling points I’d say. Although, I’m left wondering what the opening few pages have to do with the story, and how the cliffhanger ending factors into all of this. I suppose that next month’s issue will do that trick. But still, a fun issue with some great dialogue and a great whodunit as well. The art here, as I said, is headlined by Patrick Zircher, colours by Matt Hollingsworth and letters by Carlos M. Mangual. I really enjoyed seeing Patrick’s take on everything, whether we talk Barry or his speed-running or the supporting cast like Patty and Director Singh (on that note, when did Singh become a Director of the CCPD? I thought he too was a detective?). His art style is much more intense and quite different from how Brian and Francis handled the artwork prior when they were still the lead creators on the title. In particular though, I really loved how expressive all his characters were and how the perspectives always spotlighted the characters in the best way possible. And Matt’s colours were top-notch as well. They aren’t quite the bright palettes that Brian used before, but he still gives everything depth and nuance, so that was nice. Not as great an issue as the previous ones that Brian has done with Francis, but a good issue nonetheless. More The Flash: Annual #2, Volume 4, #23.1, #23.3, #25, #26. 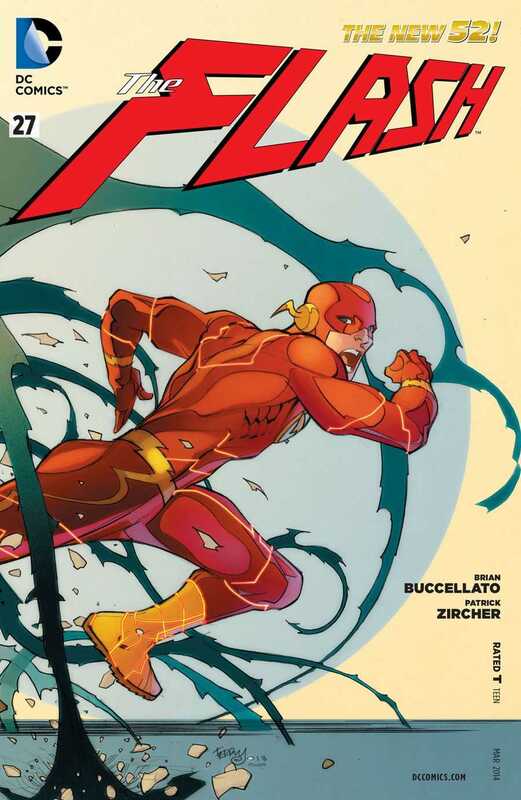 Posted on January 30, 2014, in Comics Reviews, Review Central and tagged Barry Allen, Brian Buccellato, Chroma, Comics, Comics Review, DC Comics, Flash, Matt Hollingsworth, New 52, Patrick Zircher, Review, Review Central, Scarlet Speedster, Spitfire, Superheroes, Supervillains, Tar Pit, The Flash. Bookmark the permalink. 3 Comments.